New Zealand legend Dan Carter scored a try and finished with 21 points to inspire Kobe Steelers to a 36-20 victory over Suntory Sungoliath in a man-of-the-match Japan debut Friday. The 36-year-old flyhalf, who ended a storied international career by helping the All Blacks capture a second successive World Cup in 2015, opened his account by landing a penalty in the eighth minute after missing an early conversion. But he triggered huge roars from a sellout Tokyo crowd when he crossed for his first Top League try after 21 minutes, collecting a pass from Hiroshi Yamashita and racing clear to finish a flowing move he had initiated deep in Kobe territory. Carter made six of eight attempts with his trusted left boot in a comfortable away win over the reigning champions for Kobe, their second straight win to start the fledgling season. At the final whistle, Carter shared a wink and exchanged a friendly word with Suntory back Matt Giteau, a fellow 100-cap former Wallabies rival. "It's amazing to finally be able to pull on the famous Kobe Steelers red jersey," said Carter after the game. "I missed a couple of kicks early that put me under a bit of pressure. But I really enjoyed coming up against a quality team like Suntory and it's great to get the result," he added. "As a team and individually we've got to keep striving to get better each week and if we do that it will give us a chance to reach the playoffs." Carter, a three-time world player of the year and widely considered the best flyhalf ever to play rugby, has signed a two-year deal with Kobe. 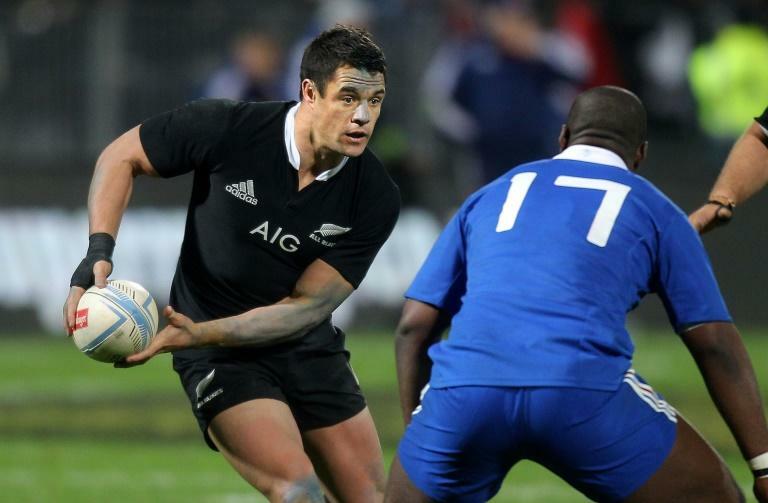 With Japan gearing up to host the 2019 World Cup, the All Blacks great is the biggest name to join the local professional league after completing a three-year spell in Paris with Racing 92. Japan back Kotaro Matsushima tried to inject some urgency into Suntory with a try after 54 minutes but Carter and substitute Andy Ellis -- his regular scrum-half with the Crusaders -- quickly recovered control to snuff out any chance of a comeback. "Obviously he's world class," Kobe coach Dave Dillon said of Carter. "He showed that tonight and we're very pleased to have him. I'm very happy with the way the boys performed, but it's only one game so we've just got to keep going."